I started going to SoulCycle shortly after they opened in 2006. I was so happy it was only one and half blocks away! After my first class, I felt really awesome for so many different reasons. I was an outdoor cyclist and a runner in the hills of Northern California. I used to ride about 200 miles each week and I really missed the feeling of freedom, joy, and release that riding gave me. In my first SoulCycle class I really felt that beautiful freedom physically, emotionally, and mentally. It took me a long time to feel comfortable in the room though with other people since I was used to riding and running solo. I loved sitting in the back of the room to "take in" the experience. I didn't do any choreography for a long time. Every teacher I went to allowed me to sit in the back and do my thing. I am so grateful for that because eventually I "came to" what other riders were doing in the room and started to become curious about myself to see if I could do what they were doing too. SoulCycle has initiated and fostered change in every area of my life: eating, relationship to myself, relationship to others, and of course career! When I came to Soul after losing 85 pounds, I was seeking "fitness" that would be about my body, but also have elements that were going to be more than about my body. Soul's "Mind Body Cardio" said it all to me about what I could expect. I had "yo-yo" dieted my entire life and I was extremely determined not to have the weight come back this time. I was 33 years old when I started at Soul, and I knew enough to know that this was going to have to be an inside job. Meaning, I would need to do the emotional, mental and spiritual work to make choices I could feel proud of in my life. That included not only what I chose to eat, but also being single after getting divorced at 30 years old, who I chose to have in my life romantically as well as friendships. I believed from my very first class, that Soul offered what I wanted. Sure, my Soul practice inspired how I eat. My choices of food became a reflection of the self-respect and confidence I was gaining at SoulCycle. Before Soul I used to be really good at "disciplining" myself to eat certain "healthy" foods, or implement a new kind of diet. Yeah, I've tried just about every "diet." And that really, really works for a lot of people. It just never worked for me for the long haul in and of itself. But the truth is, changing my eating was because of an internal process I had to have and continue to have. I used to be on this cycle that eventually after every "diet" I would start making most of my choices, including food, out of self-hatred. And that way of thinking and doing became a cycle for me. A cycle that because of Soul, I was finally REALLY interested in breaking. So as I became more integrated physically, emotionally and spiritually at SoulCycle, the more connected I became to myself. How I eat now, which is a good balance of "healthy" and societally perceived "naughty" foods is an outgrowth of internal change at Soul. 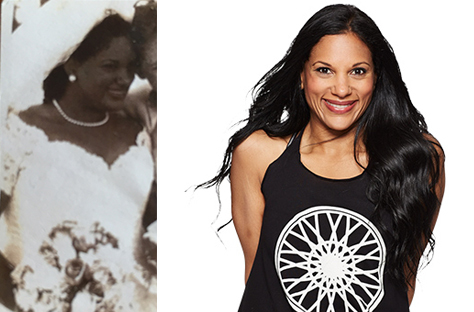 Through riding at SoulCycle, I started noticing some changes right away and others over time. Right away I noticed myself getting stronger with more muscle definition. I started to notice that I could stay out of the saddle longer for runs and jumps. I really began to recognize my willingness to do the choreography because it no longer freaked me out and looked so fun. As I gained strength, I started to feel more confident in my life. I have really seen areas in my body change — I mean, areas in my 30s and now in my 40s that I thought would NEVER change. I am 100 percent in better shape all the way around than I have ever been in my life. Internal and external change for me is a process and journey that will always continue and be fluid. I grew up in an environment that was about surviving. Part of my surviving meant spending a lot of time in my head, using my wits to get me through. It also meant for me, setting emotions aside to make it through each day. My body/mind relationship was very "disconnected." Riding at SoulCycle has been a journey of healing physically, emotionally, mentally, and spiritually. I didn't even dare to dream or imagine what it could be like for my life to not just survive, but actually thrive until about three years into riding at SoulCycle. I started to consider maybe what was possible in life was more than what I could see right in front me. On the bike, I began to get curious about exploring possibilities in the pedal stroke through the pushes against resistance, the jumps, runs, sprints, hills, and jogs. Even though I didn't really talk to anyone in class for a long time, I took comfort that I was going to see familiar faces and that most of the time the past few years, I was going to ride on familiar bike 5 at West 77th Street. I am definitely not qualified to give advice to anyone as to how to make a change because I don't have answers for anyone. I can only speak to "change" from my personal experience and what has helped me: My SoulCycle practice started to clear away the "clutter" literally and figuratively in my life. So much so that I actually saw that my life could have a direction and that I could be an active participant in it. Many of my self-destructive habits were replaced with habits that were reflective of the direction I wanted to see my life going. To really make a change, I had to see that being informed by my history was useful, but I no longer needed to make choices because of the parts of my history that didn't serve me anymore. That also included — and I speak only for myself — getting a bit more engaged with my practice at Soul. Having studied most of my life to be an opera singer, I was very familiar with the kind of self-discipline required for a daily practice. It meant showing up and clipping in for class even if I didn't want to. Also taking the rest I needed if I was sick. That's why I emphasize so much that we are a team in class and that we ride as who we are and where we are on that given day. We carry each other. We never know what the rider next to us going through. We give what we can on the days we feel strong and take what we need on the days we don't. As I became willing show up, every area of my life began to really change. I started to see the results of making conscious choices. I think of three steps: awareness, acceptance and action. I almost always catch myself jumping from awareness to action because acceptance can be really really hard, especially if I don't like what I am seeing in myself. Awareness of who I am and my situation. Acceptance of who I am and my situation. And then I become primed to take Action when I am ready. When I teach, I find myself talking about what SoulCycle has given to me because I want to speak honestly. I really can only share with riders what I know from my own experience at SoulCycle; finding your voice in your life; learning to own your space in the room on your bike; having compassion and gratitude for who you are, of others, and where you are in your life; to dare to dream. Larger change is the result of daily choices. One day at a time, those daily choices begin to add up and a picture starts to emerge. Maybe it's the picture you imagined or maybe it's a picture that takes you down a very interesting, unexpected path. You might be amazed by what you are capable of and what is possible. 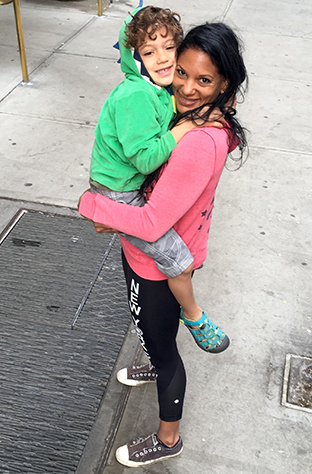 Catch classes with Anandah at SoulCycle West 77th Street, East 83rd Street and SoulCycle West 92nd Street! Questions or comments? Email blog@soul-cycle.com!